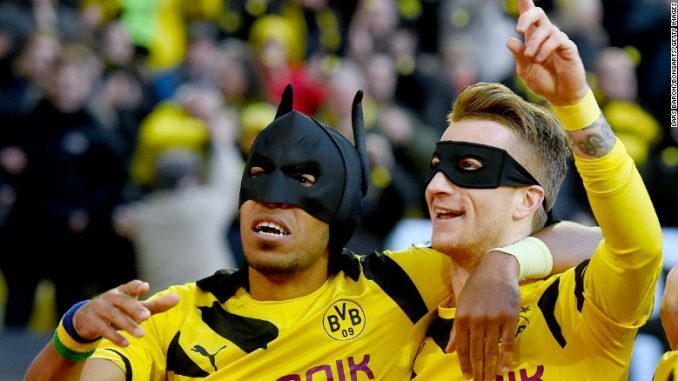 Aubameyang and Marco Reus celebrate as Batman and Robin after scoring against Schalke last year. From superhero masks to acrobatic flips, there’s nobody quite like Pierre-Emerick Aubameyang when it comes to goal celebrations. And with 15 goals in just 12 Bundesliga games this season, the Borussia Dortmund star is having plenty of opportunities to celebrate in style. In a sport that punishes players for ripping off their shirts after scoring, Aubameyang has almost become as famous for his innovative celebrations as he has for his goals. But what does he want to be remembered for once he hangs up his boots: goals or guises? 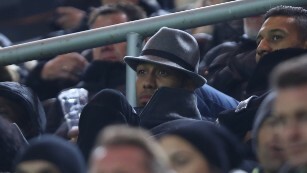 Aubameyang watches his team from the stands during the Champions League against Sporting. Speed is another of Aubameyang’s attributes. In 2013, he clocked 3.7 seconds in a 30-meter training run — eight hundredths of a second faster than Usain Bolt managed over the same distance during his 100m world record sprint in Berlin seven years ago. Aubameyang’s personality off the pitch is equally as colorful as the child-like joy he exudes when playing football on it. In November, he drew comparisons to Inspector Morse for the hat and jacket he wore when watching his Dortmund teammates from the stands. “I’m like this. When I feel something, I want to do something, I do it — I just do it. So I’m like this also in my life, if I want to wear some crazy clothes, I put it on. Aubameyang’s performances in his three years at Dortmund have drawn longing gazes from some of Europe’s biggest clubs. Along with being named last season’s Bundesliga Player of the Year, the Gabon international also became his country’s first ever African Player of the Year in 2015. In February, he told reporters he had promised his dying grandfather he would one day play for Real and rumors of a transfer to the Spanish giant have been ongoing ever since. His suspension from last month’s Champions League clash against Sporting — for “internal reasons,” according to coach Thomas Tuchel — only served to stoke the fire. However, Aubameyang, who has a contract with Dortmund until 2020, insists he is going nowhere. “I’m really happy to be here now,” he tells CNN’s Alex Thomas with conviction during their interview in late November. “It’s already been three years since I came here and of course I’m enjoying every moment because we have great fans. “It’s a great atmosphere when you play inside this stadium,” he adds, referring to Dortmund’s Westfalenstadion. “And last year we did very well, we had a very good season. In his time at Dortmund, Aubameyang has seen star names such as Mario Goetze, Mats Hummels, Robert Lewandowski and Henrikh Mkhitaryan leave for pastures new. That affinity each player has with the club is largely down to the fans that make Dortmund the best supported team in Europe. More than 81,000 fans pass through the gates every match day and the Westfalendstadion boasts its fearsome “Yellow Wall” of supporters, who make up Europe’s largest free-standing terrace. “It’s 25,000 people only on one side, so of course you enjoy it. Every time when you go on the pitch it’s just crazy. Aubameyang’s professional career has seen him take in the sights of Italy and France, before really making a name for himself in Germany. One thing that sets the Bundesliga apart from other league, he says, is every team’s incessant will to win. “In France, sometimes, you have some players or coaches say, ‘If we go there and we come back with one point, it’s okay,'” Aubameyang recalls of his time in Ligue 1. While Aubameyang’s greatest asset has always been his searing pace, he openly admits the rest of his game has matured since arriving at Dortmund. “Maybe it’s my age,” he chuckles. “I’m getting some experience now and I really feel no pressure on the field, so I think it’s about my age. When you play so many games, like Champions League or Europa League, after that you know how to play with the pressure. It’s not a problem. “But my speed is really important for me. If I ever have a one-on-one against a defender, I know that I can beat him — so that’s an advantage for me. “Before I think I was only playing with my speed, but now — okay I’m not stupid — I use my head. I use my head to improve my speed, so now I’m mixing speed and precision, which is why I’m getting better. “I think last year I scored … some goals,” Aubameyang grins modestly, despite scoring 36 in all competitions. That speed which is so vital to his game is also the attribute that turned him into a worldwide superstar. Before his goals made him a household name on the pitch, Aubameyang became a global icon for being the fastest player on FIFA and PES — the world’s biggest football computer games. And with Bolt reportedly set to train with Dortmund when he retires from athletics next year, would Aubameyang come out on top in a 30m showdown? “I dunno really, I dunno (if I would beat him),” says the Dortmund forward with a laugh. “But I want to run with him one day because I want to see how fast I am — maybe I’m really bad!